Nuclear magnetic resonance spectroscopy, which has evolved only within the last 20 years, has become one of the very important tools in chemistry and physics. The literature on its theory and application has grown immensely and a comprehensive and adequate treatment of all branches by one author, or even by several, becomes increasingly difficult. This series is planned to present articles written by experts working in various fields of nuclear magnetic resonance spectroscopy, and will contain review articles as well as progress reports and original work. Its main aim, however, is to fill a gap, existing in literature, by publishing articles written by specialists, which take the reader from the introductory stage to the latest development in the field. The editors are grateful to the authors for the time and effort spent in writing the articles, and for their invaluable cooperation. 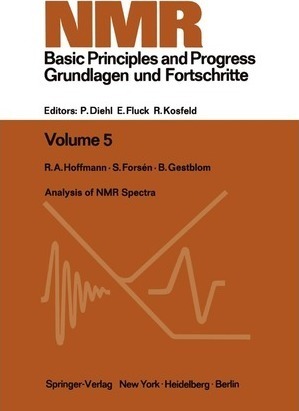 The Editors Analysis of NMR Spectra A Guide for Chemists R. A. HOFFMAN t S. FORSEN Division of Physical Chemistry, Chemical Center, Lund Institute of Technology, Lund, Sweden B. GESTBLOM Institute of Physics, University of Uppsala, Sweden Contents I. Principles of NMR Spectroscopy 4 1. 1. The Magnetic Resonance Phenomenon 4 a) Nuclear Moments. . . . . . . . 4 b) Magnetic Spin States and Energy Levels 5 c) The Magnetic Resonance Condition. 7 d) The Larmor Precession. . 7 e) Experimental Aspects . . . . 8 1. 2. Chemical Shifts . . . . . . . . 9 a) The Screening Constant 11. . . 9 b) Chemical Shift Scales (11 and r) 10 1. 3. Spin Coupling Constants 12 1. 4. Intensities. . . . . . . .